The collaboration between Thomas Wardle (1831-1909) and William Morris (1834-96) was a turning point for both men. At the same time as Wardle was researching and developing Indian silks and natural dyestuffs, Morris was struggling to get the good printing results he needed for his designs. 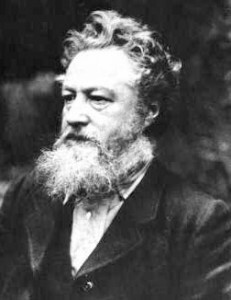 Between 1875 and 1877 Morris travelled to Leek in Staffordshire to stay with the Wardle family. He learnt everything he could about dyeing and printing with natural dyes from Thomas Wardle at his Hencroft works in Leek. Both men had ambitions to obtain the depth of colour from natural, permanent dyes similar to those in Indian textiles. Indian methods of dyeing were tested on site as Wardle turned from dyeing to hand block printing. These experimental times were often explosive as over and over they struggled to get the results they needed. By 1876 Wardle was printing a range of fourteen designs for Morris. After his ‘apprenticeship’ in Leek came to an end Morris set up his own print works at Merton Abbey. 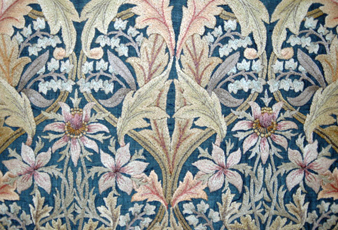 Wardle companies continued to print the early designs by Morris while Morris & Co. existed. Their combined expertise established a benchmark in British printed textile design. Their textiles were exhibited many times at major exhibitions and were still the best of their type more than 20 years later. Wardle said of Morris that he had an understanding of form and colour which was unparalleled.